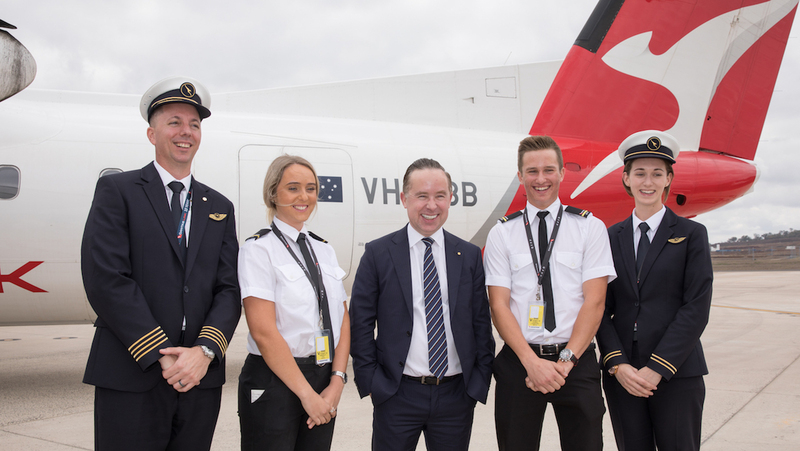 It was, in the end, a clear-cut decision, said Qantas chief executive Alan Joyce as he announced the first of two new Qantas pilot academy sites will be located at the privately-owned Wellcamp Airport at Toowoomba, 140 kilometres west of Brisbane. And he has no qualms about pitting regional airports across the country against each to win the prized business. “We wanted a completely open and transparent process to make sure every regional airport had a chance to put in a bid,” said Joyce. “The best wins and Toowoomba won because they had the best proposition in terms of facilities, the community where people can be based and the attractiveness of it, the location to Brisbane and the world gateway. Wellcamp is Australia’s only privately-owned international airport (thanks to three weekly cargo flights from Hong Kong operated by Cathay Pacific) and it aims to have the academy up and running by the middle of next year. “Construction starts tomorrow,” said Wagner Corporation director Denis Wagner. Joyce wouldn’t give a breakdown of the $35 million the project is costing but said the vast majority was private money, from Qantas, the Wagners and L3, the global pilot training organisation that will operate the academy, with additional assistance from the Queensland State Government. Qantas has previously said it is committing $20 million to two academies. A decision on the second location will be made sometime next year. Wellcamp will have the capacity to train 250 pilots a year from Australia and overseas. It will have a new hangar, classroom facilities and student accommodation. With estimates some 790,000 new pilots will be required over the next 20 years, more than a third in Asia Pacific, Joyce is confident the two Qantas Pilot Academies eventually will become a huge commercial success. The shortlist of nine regional cities contending for the facilities included Alice Springs, Bendigo, Busselton, Dubbo, Launceston, Mackay, Tamworth and Wagga Wagga. They are still under consideration for the second academy site. Joyce said the airport, state and local government, and the community had demonstrated that Toowoomba would make an excellent home for the first Qantas Group Pilot Academy site. “Qantas has a well-earned reputation of having some of the world’s best pilots. For many of them, the journey will start right here in Toowoomba,” he said. It is expected that building the facilities at Toowoomba will create more than 100 direct jobs and around 300 indirect jobs in the local construction industry. The Toowoomba site will create ongoing employment for up to 160 people in training and support roles, plus significant flow-on opportunities for local businesses. Across two sites the academy is expected to eventually grow to train as many as 500 pilots a year, including for other airlines and general aviation. A decision on the second site will be made before the end of the year. And the winner is ….. Toowoomba! “Wellcamp is Australia’s only privately-owned international airport”… Canberra? Did Avalon feature in the selection process? Wagners will just make this happen… unlike certain other airports located west of the state capital that have long been mooted. Will Airservices be putting in a Control Tower?